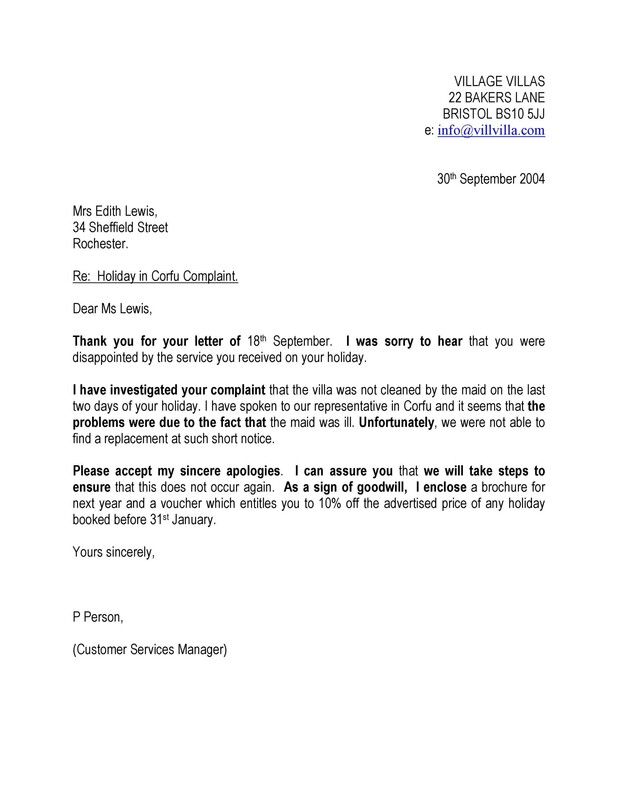 Customers are often confronted with issues that need attention and the best way to do this, in the absence of immediate channels where they can voice their dissatisfaction, is through a written complaint. 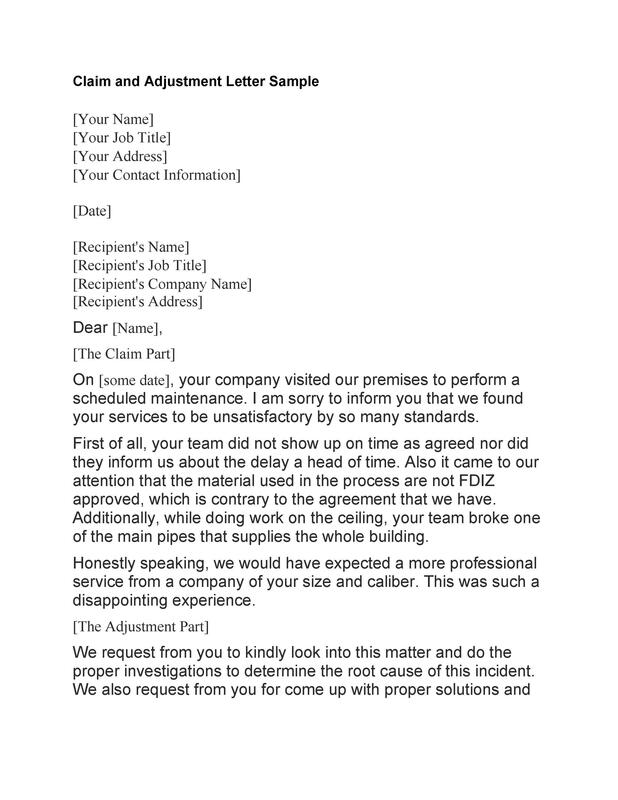 Companies often receive these letters and will need to respond. 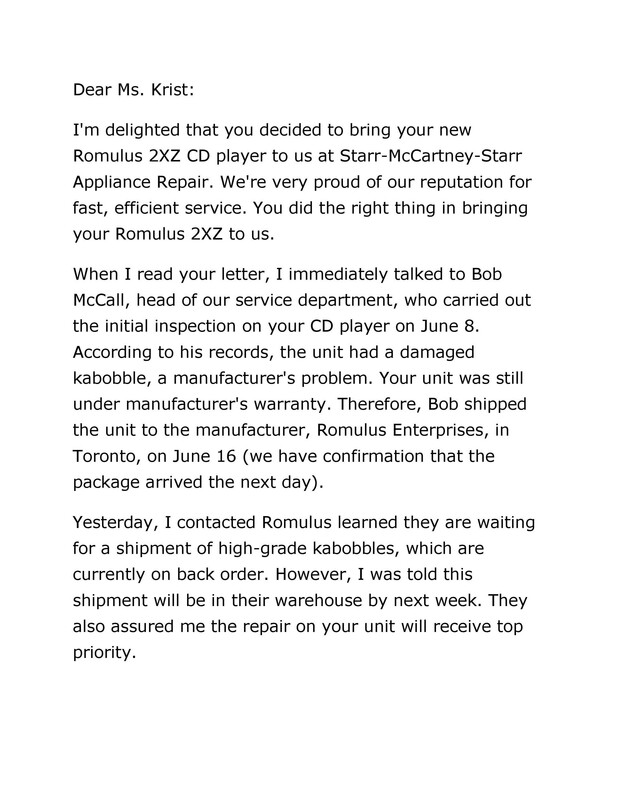 Bear in mind that the customer has experienced an inconvenience and it will be up to the company to mend fences to continue an amicable relationship with the customer. 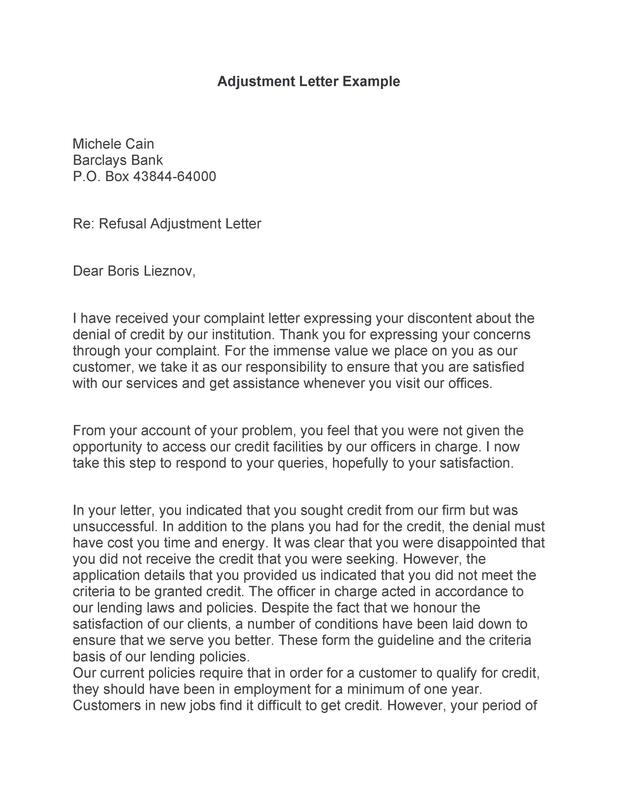 A well-written adjustment letter will be a good start. 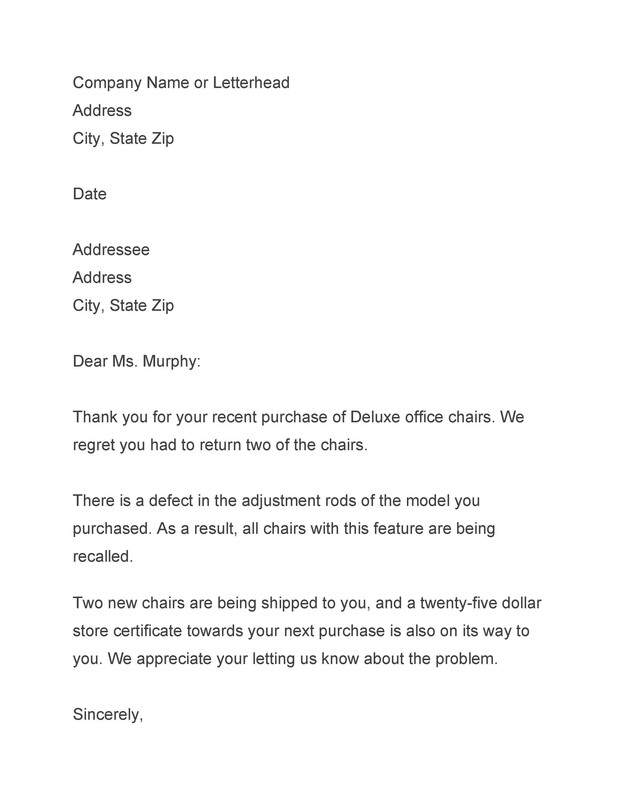 2 What is an adjustment letter? 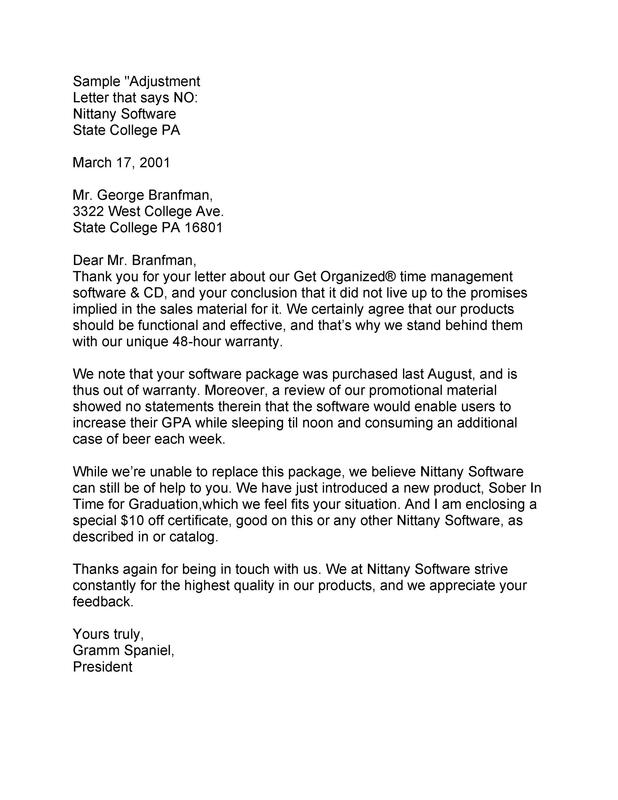 5 How to write an adjustment letter? 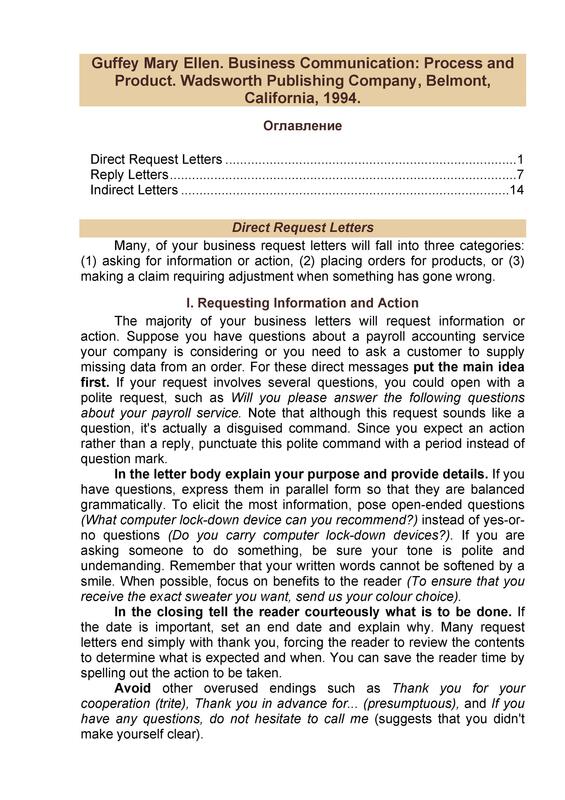 Simply worded, an adjustment letter is a formal reply to a customer’s claim or complaint. 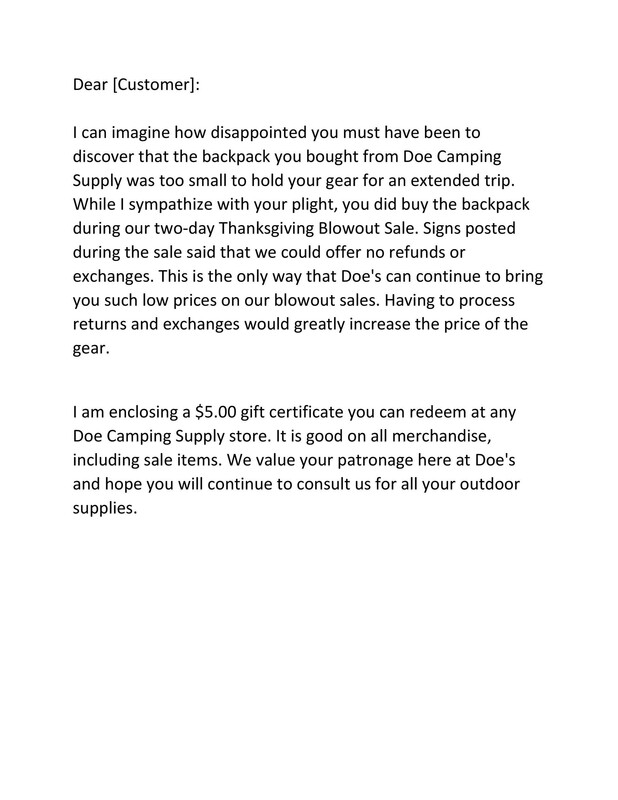 A goodwill adjustment letter will inform the latter that the company has received their complaint. 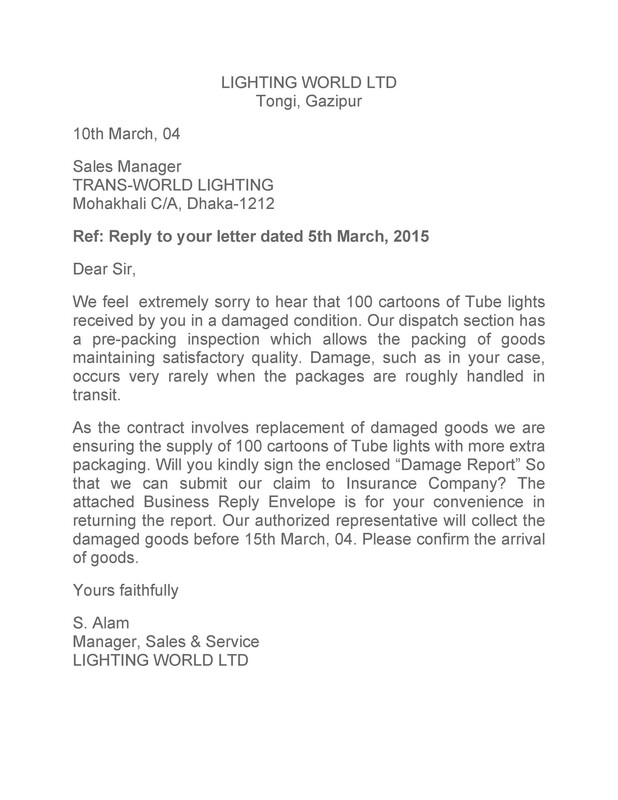 It will also specify what corresponding actions the company will take to resolve the issue. 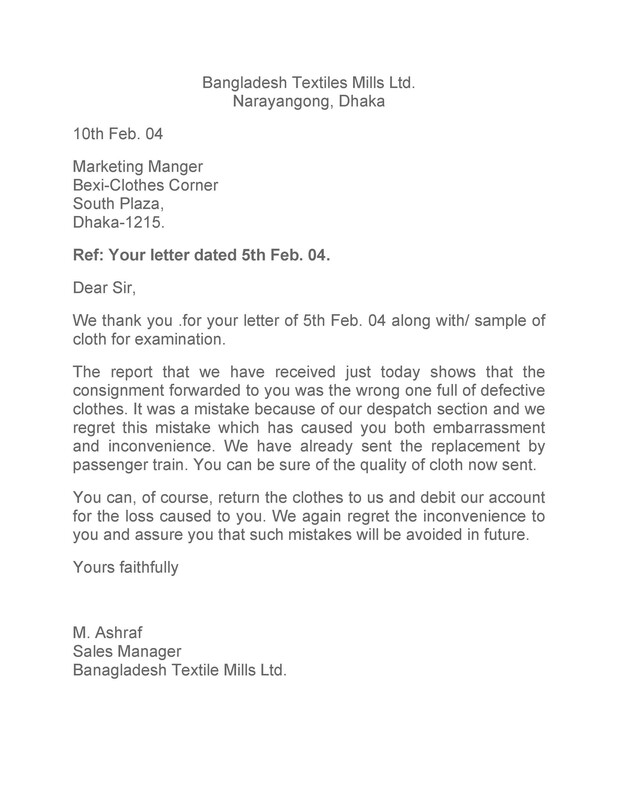 The acceptance of the customer’s claim may come in different forms, from a simple regret for the mistake to making corrections for such mistake in the form of compensations. 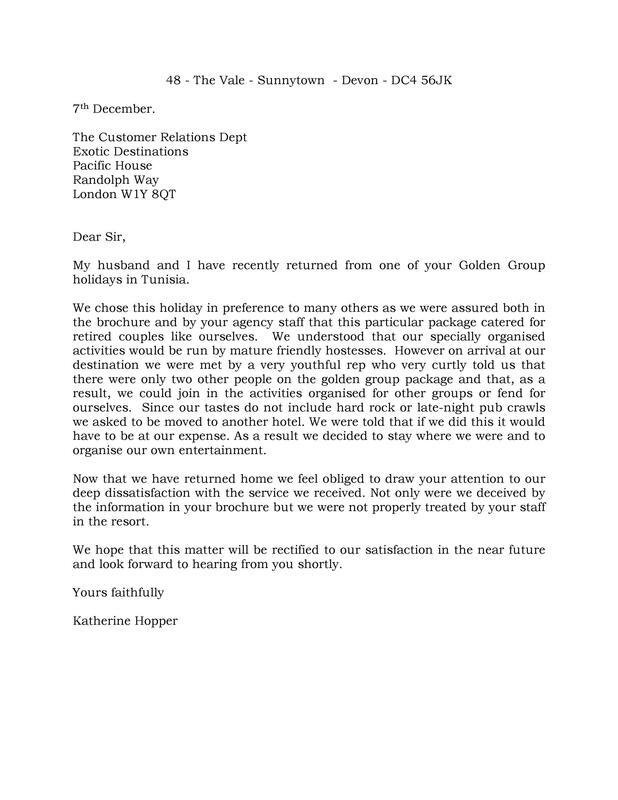 Responding to such claims is essential in promoting the goodwill of the company and in maintaining cordial relationships with customers. 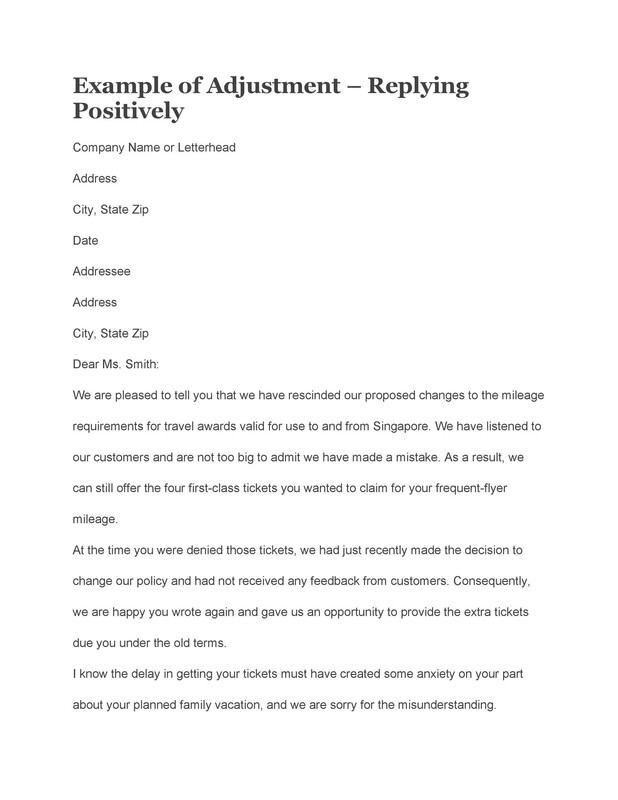 If you try to read an example of adjustment letter, you will see that it informs the customer of the validity of their claim, whether it will get granted or rejected. 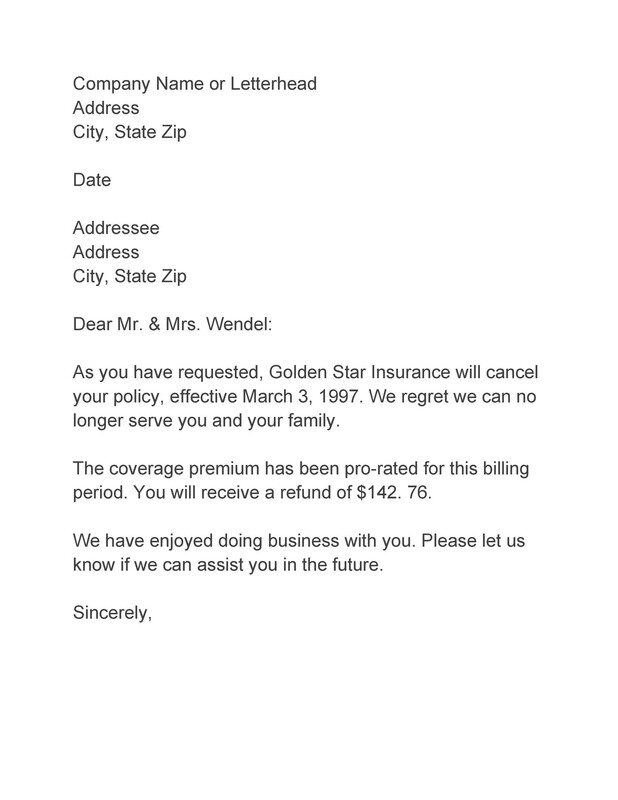 Since one of the main reasons for these letters is settling the claims of customers, it’s also referred to as a claims settlement letter or an adjustment of the status cover letter. 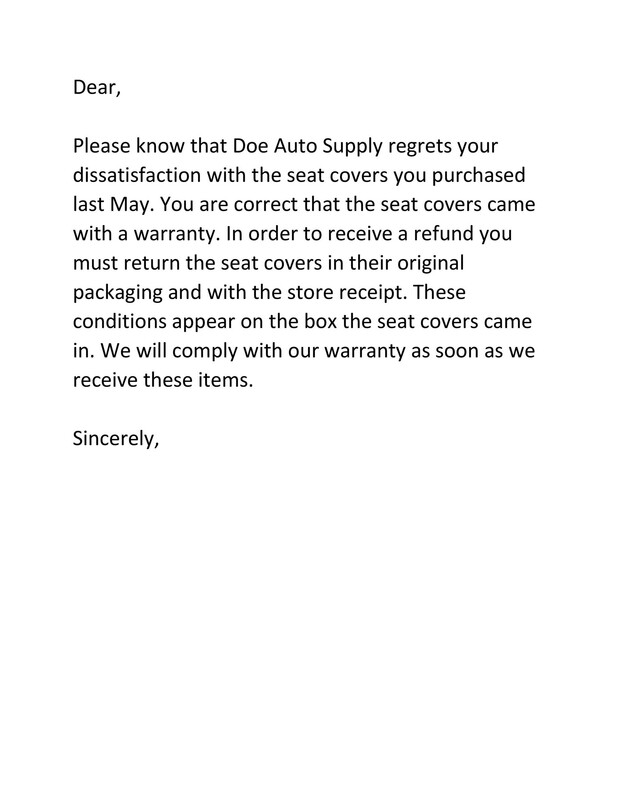 First and foremost, the adjustment letter must acknowledge the customer’s claim letter and offer an appreciation to the customer for revealing the mistakes. 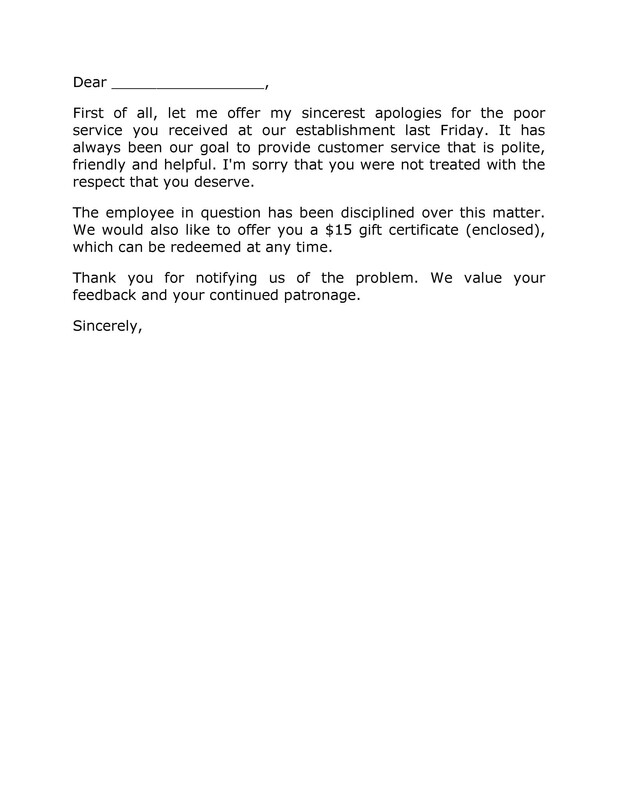 The goodwill adjustment letter must sincerely apologize for the inconvenience done to the customer. Regret, in this case, is not an admission of guilt but a professional way of admitting mistakes. 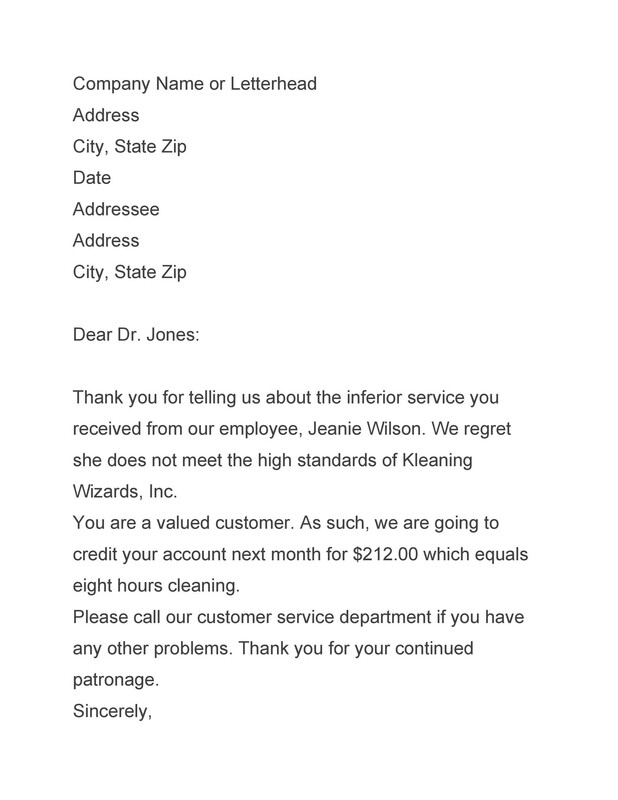 An immediate response to the complaint is necessary. 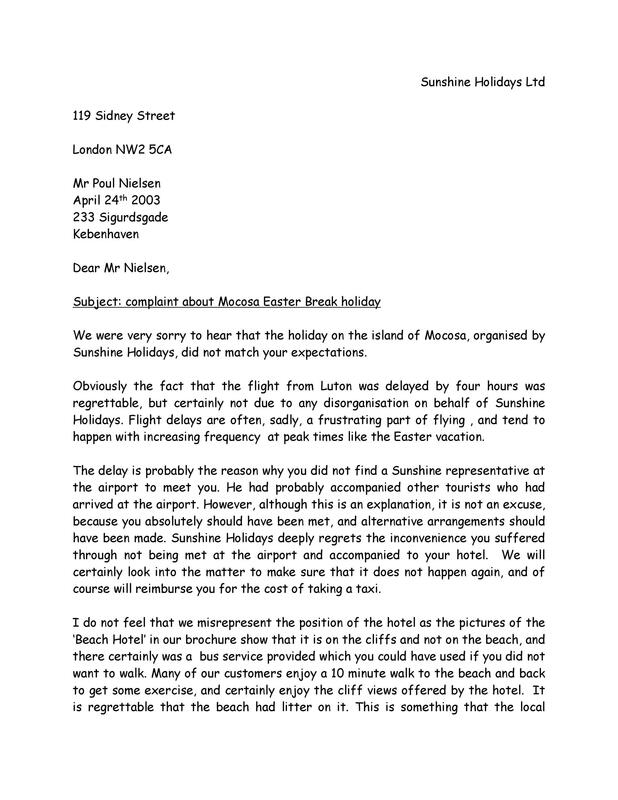 Further delays could get misinterpreted as a sign of arrogance and neglect. 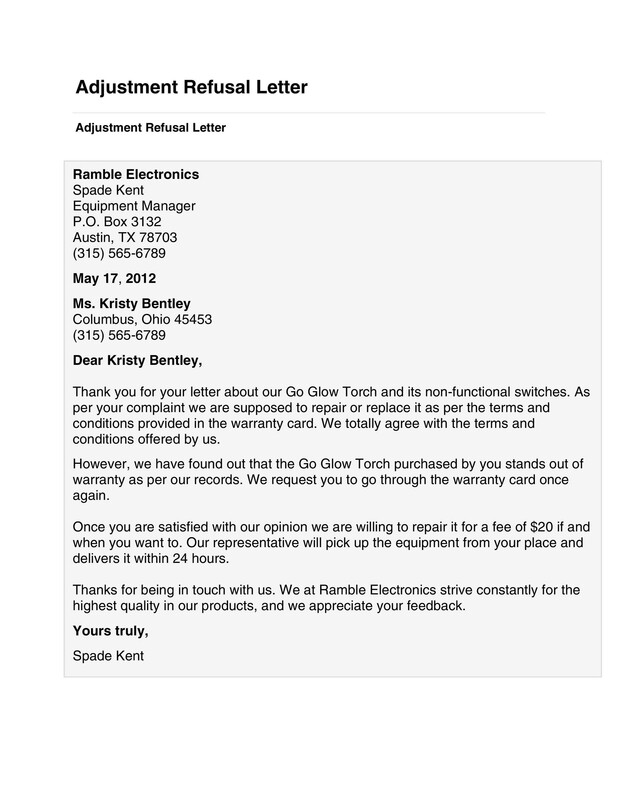 Should the customer demand for something specific regarding the complaint, like a replacement or a refund, the seller must grant this as soon as possible. 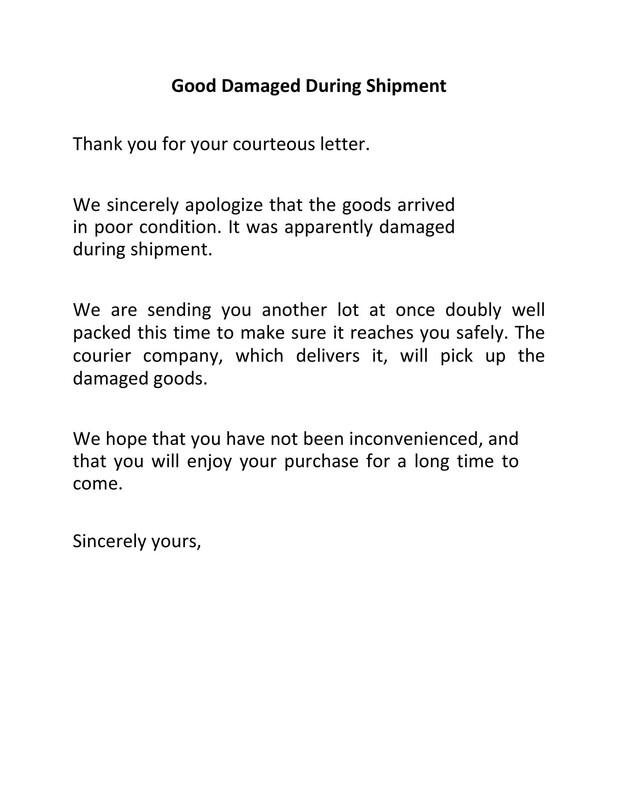 After acceptance of the complaint by the customer, the seller should indicate the preventive measures that will he will take to prevent the same inconvenience from happening again. To promote and sustain a good relationship between the two parties, the seller must also offer further cooperation to the customer. There will be cases where customers will be wrong in their claims as these could be either unfair, unreasonable or unjust. Sellers in such cases should maintain calmness rather than act violently. 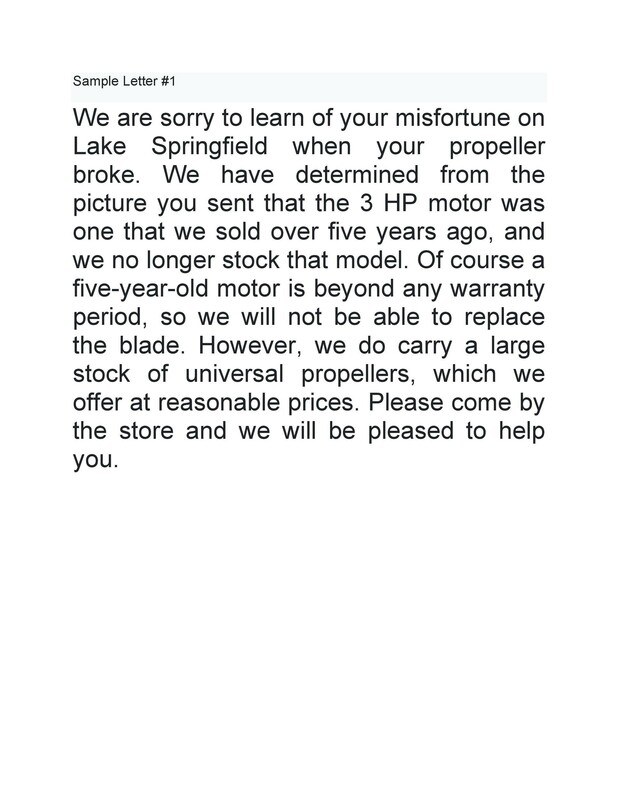 The best way to resolve this is to convince the customer by considering the issue from the seller’s point of view. Never use offensive language when composing this type of letter. 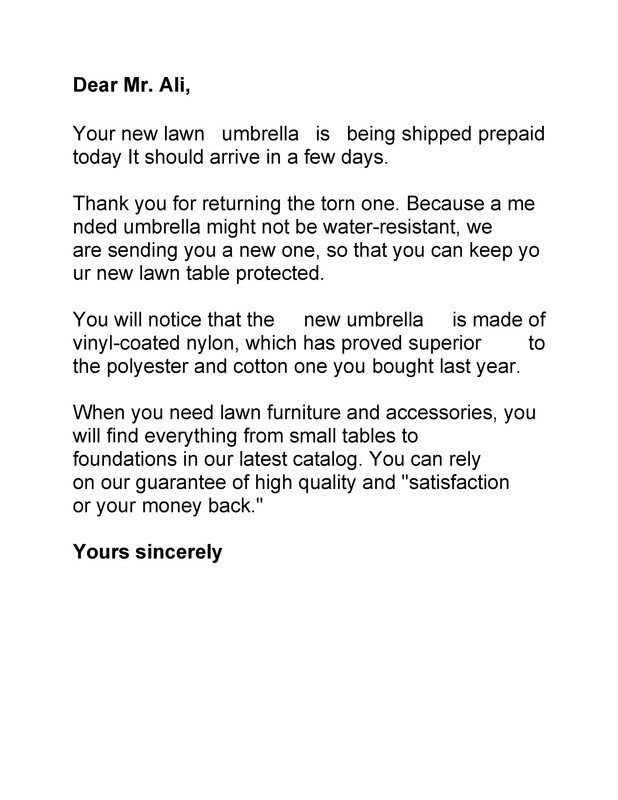 Use friendly and courteous words to help calm the customer’s dissatisfaction. 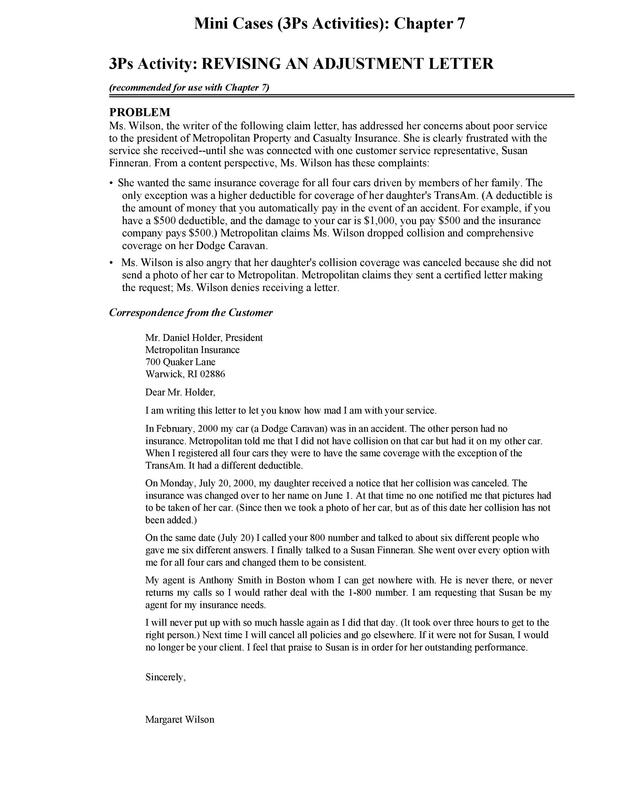 How to write an adjustment letter? 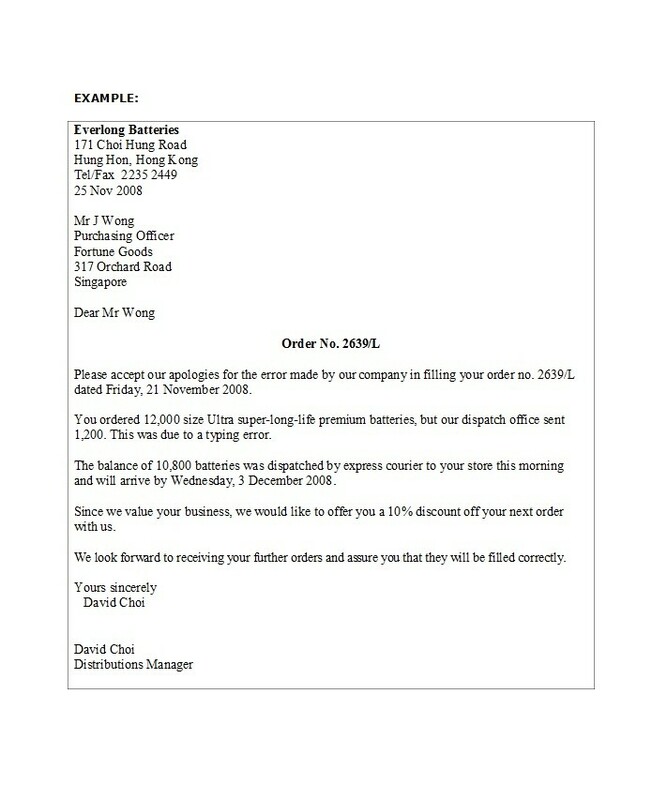 You should know the importance of adjustment letters before even starting to write one. 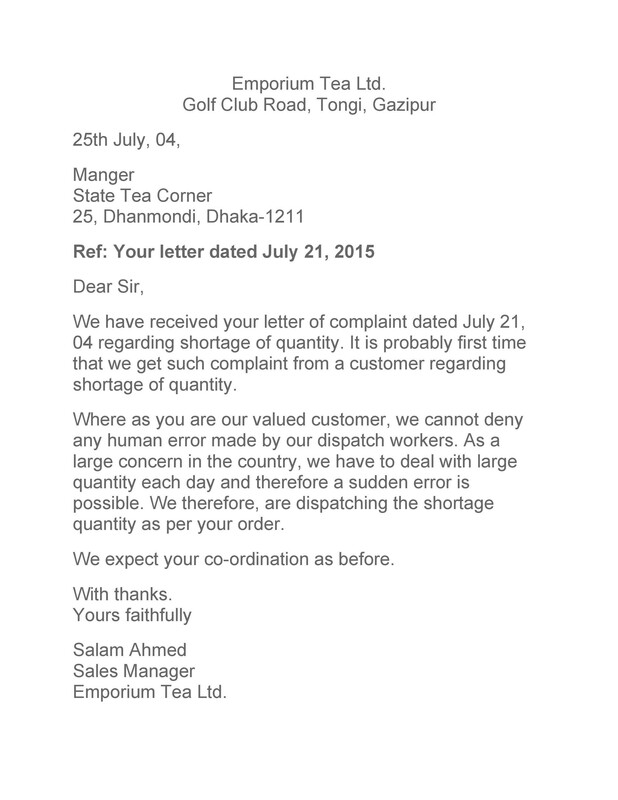 This is primarily a response to a complaint which has informed the company of its shortcomings. 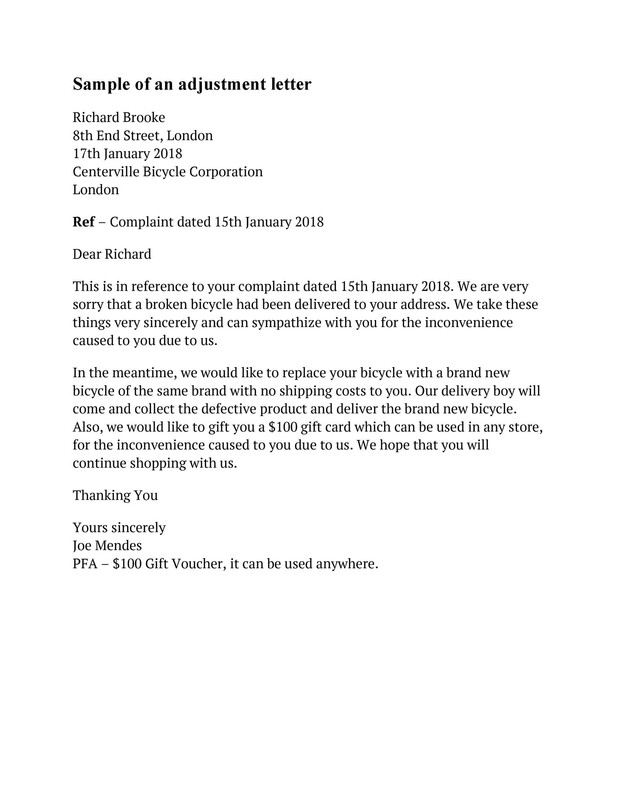 The objective of the letter is to ensure the complainant that the unsatisfactory situation or the complaint is getting addressed or corrected. Don’t give excuses or explanations about the complaint. Stick with the facts and this will make the reader understand the corrective steps that you plan to or have already done. 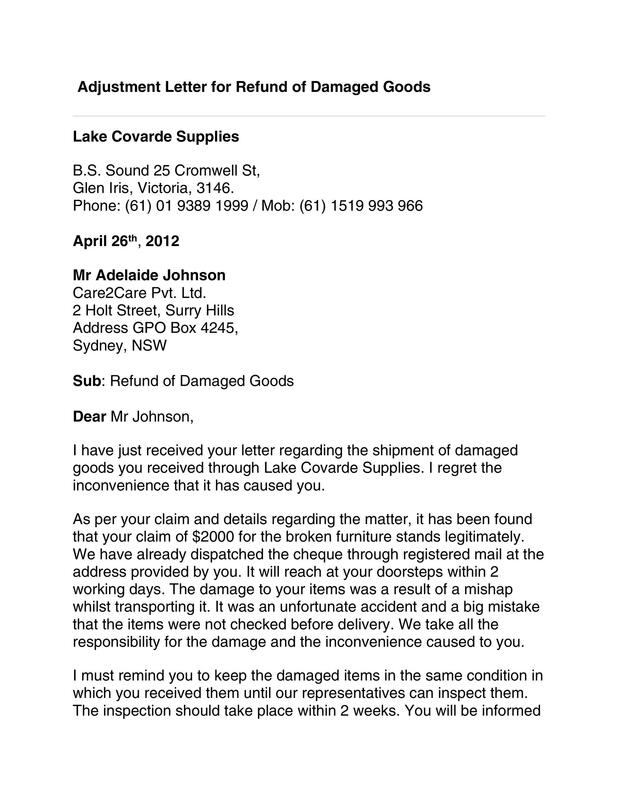 Make sure that the scope of your adjustment letter must mention only the relevant details of the claim. Then accept responsibility and offer a statement of apology. 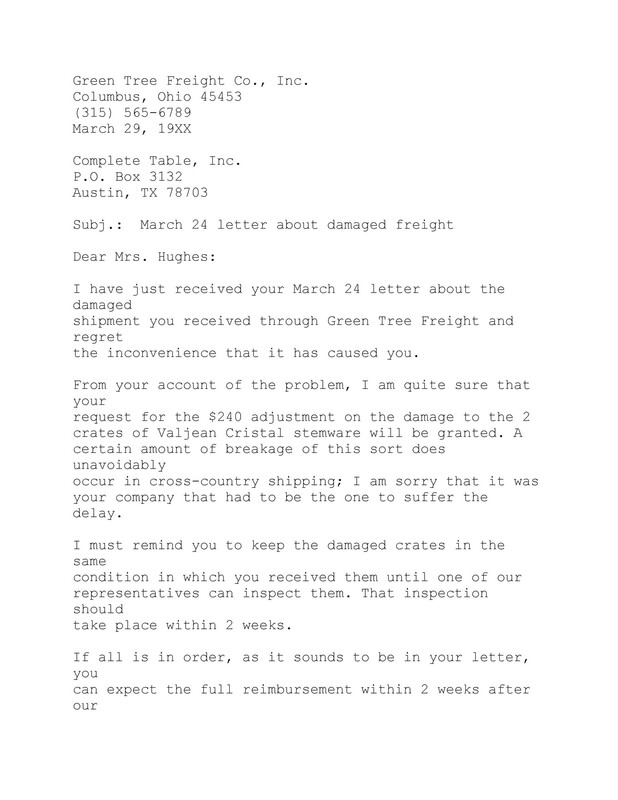 The letter should provide a complete description including times, dates, and locations of the corrective actions to implement. 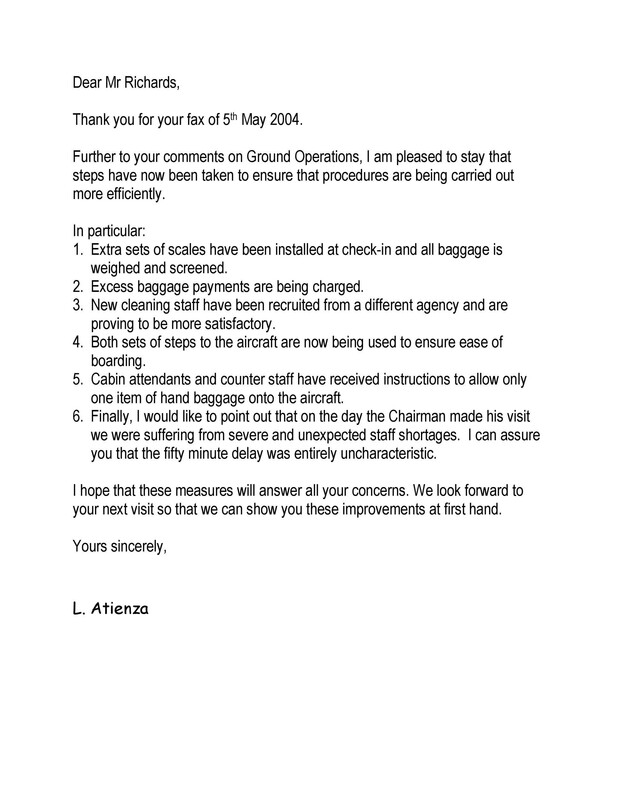 The letter should provide a coherent order in presenting the information regarding the corrective action. In a way, you already started this task when you established the letter’s objective and determined the scope. 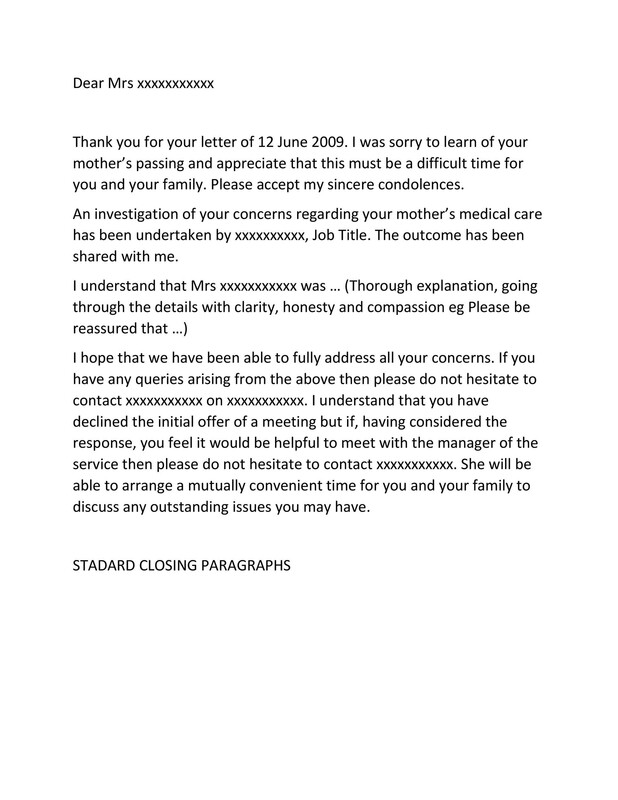 You can go back to this information and include as much of is as needed since this will serve as the body of the letter. 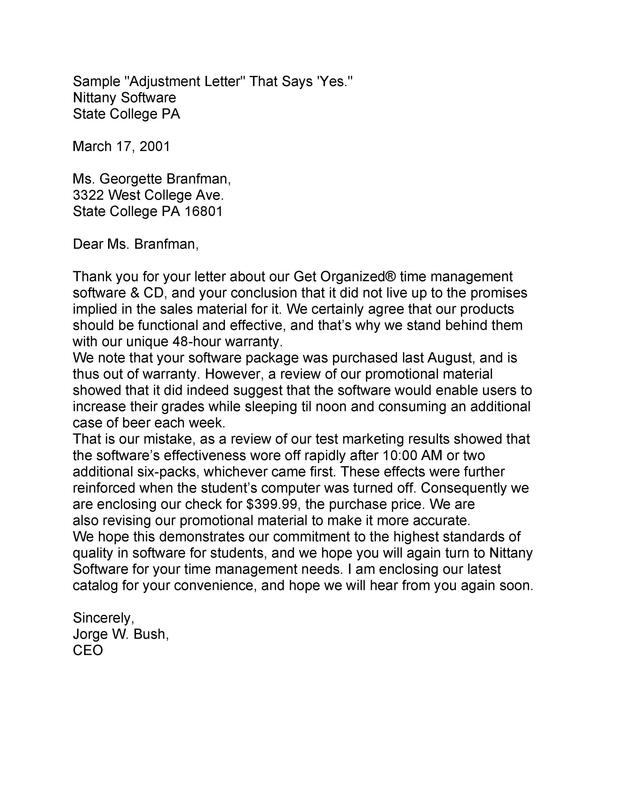 It’s advisable to first make a draft of your adjustment letter. This is an outline of the letter in its simplest form. At this point, you already have the necessary list like the objective and scope that will comprise your final letter. Refer to your draft and compose each part into a complete sentence which expresses a single idea. 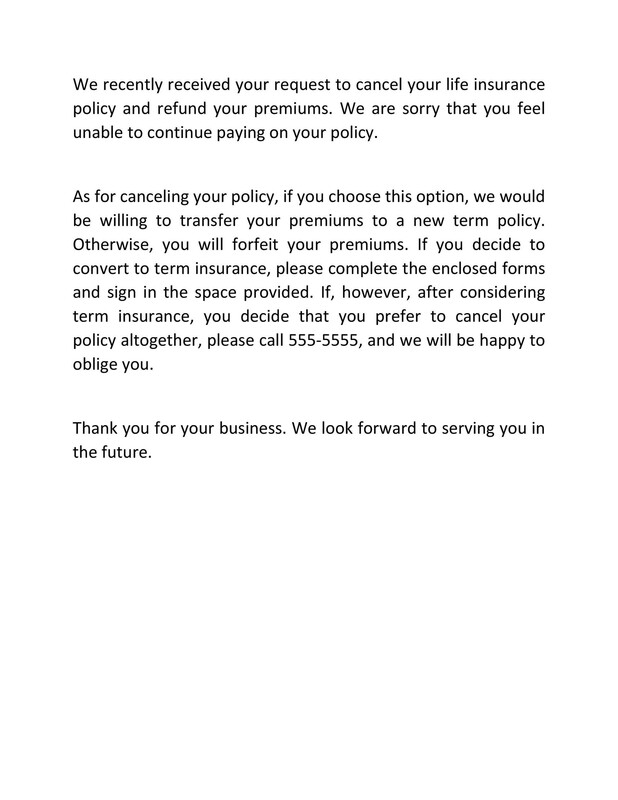 Be professional when closing your letter. 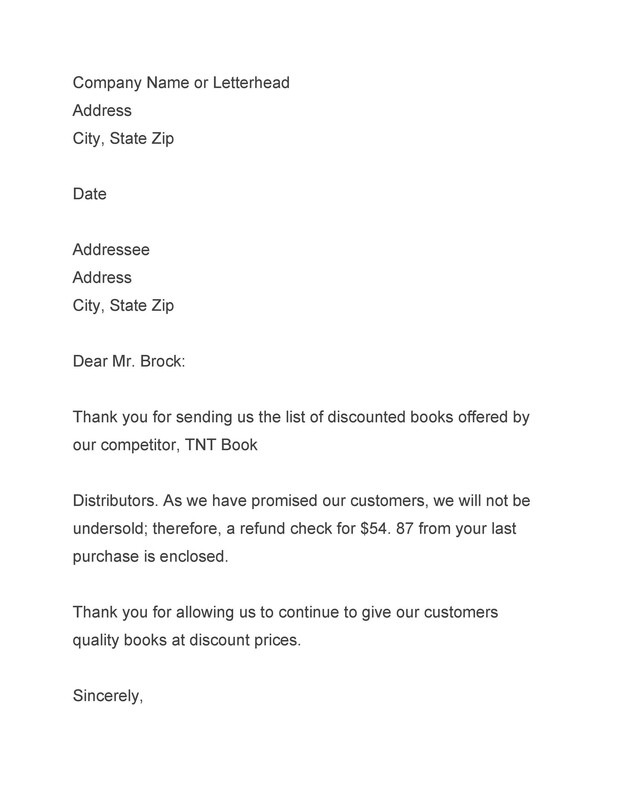 After writing the last sentence of the last paragraph, you can “sign off” with a gracious close then print your name. Finally, you will need to review then revise your letter if needed. This last check will ensure that you have clearly stated the objective and clearly defined the scope. Try putting yourself in the customer’s shoes to find out if the facts are both complete and accurate. 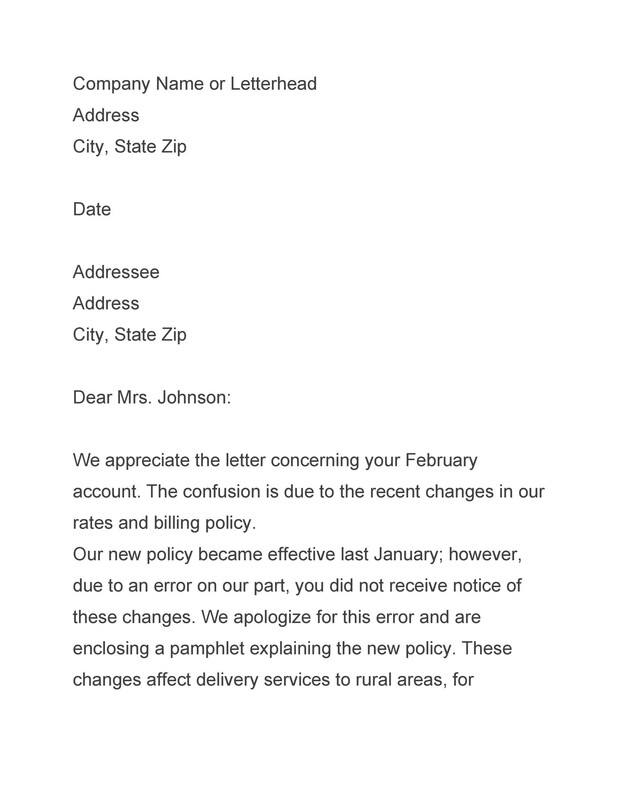 Then look for conspicuous errors in the letter’s form. Check for any sentence structure, grammar, and spelling mistakes. Remember that the contents of the letter should be highly cohesive, accurate, clear, and has a sense of unity. The transition from one paragraph to the next should have continuity. Your style, point of view, and tone should have consistency throughout the document. Also, choose your words properly so there will be no chance for ambiguity which can confuse the reader. Avoid technical jargon, clichés, affectations, abstract terms, and trite language as these might not get understood and worse, can even make your objective unclear. 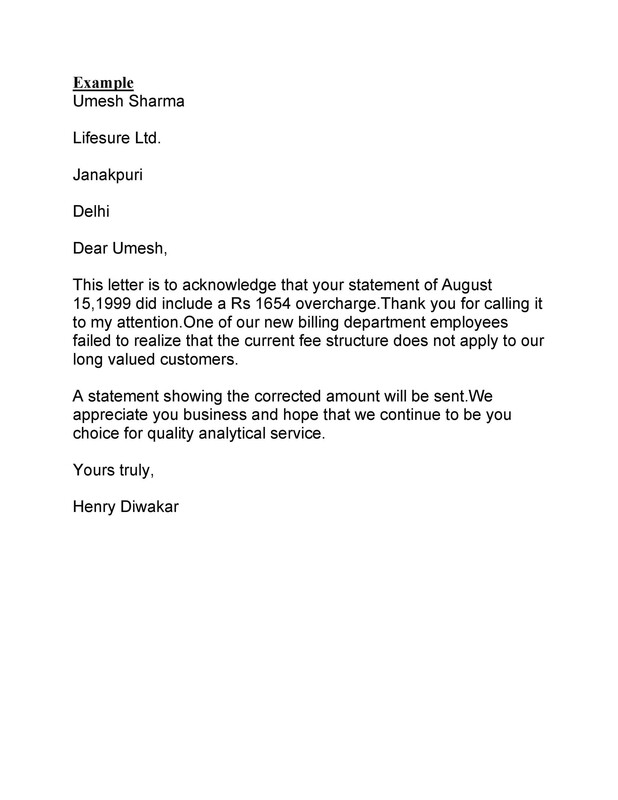 A letter which carries a positive tone could be highly beneficial to both client and vendor as both parties will get satisfaction. The vendor empathizes with the client to make the latter feel that the vendor understands their situation. The client, at times, may be at fault, but this is no reason to provoke him. It’s not right to accuse the client of any wrongdoing or make an offer of settlement with resentment. This could lead to negative publicity for the company. Often times, clients aren’t right with their complaints. In such cases, the vendor will need some tact, diplomacy, and logical reasoning to make sure that gives satisfaction to the complainant. 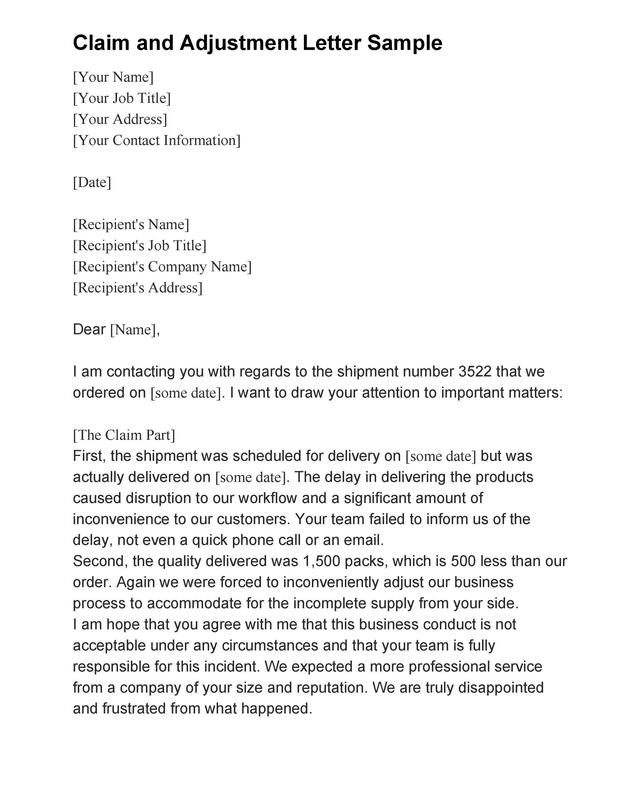 If the compensation or refund the clients asked for isn’t justifiable, don’t be too blunt. Rather, adopt a more tactful approach. Deny their request in the most congenial manner, express your concern about their complaint, and give them some appreciation for their concern about the issue. This means making the customer more comfortable and offering proper respect. You can start by addressing your client by name. This is a step towards recognizing the client’s individuality. Society knows the client by name and this, in turn, becomes the client’s identity. Addressing him by his identity will confirm his importance. If the client has a title, use this as well to the same effect. If you are any good at it, you can even introduce some relevant line of humor to ease any discord. 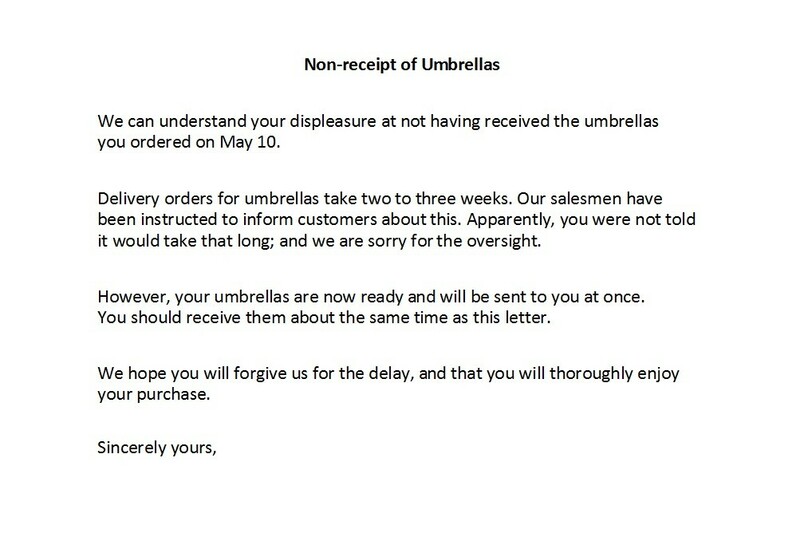 This could make the customer feel better and encourage him to take a more positive approach. 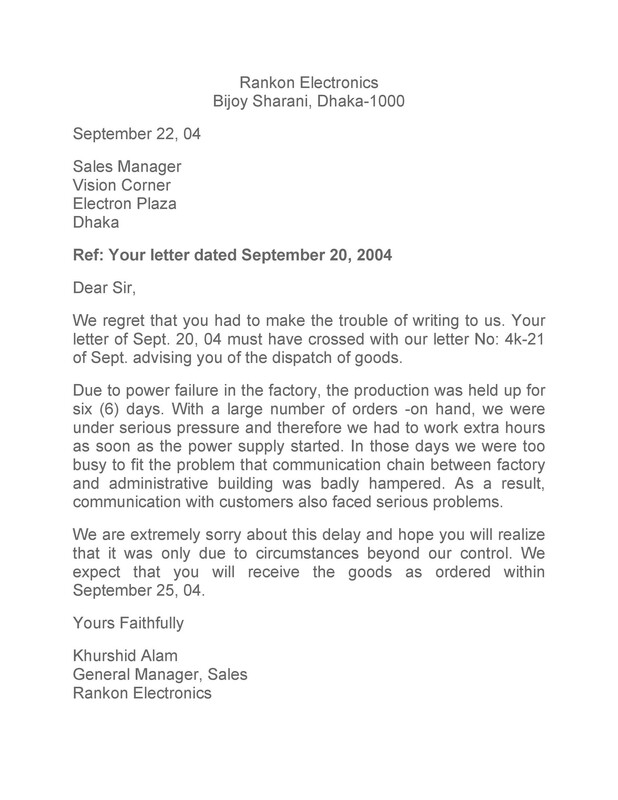 For business and other official letters, always use stationery with the company’s letterhead. 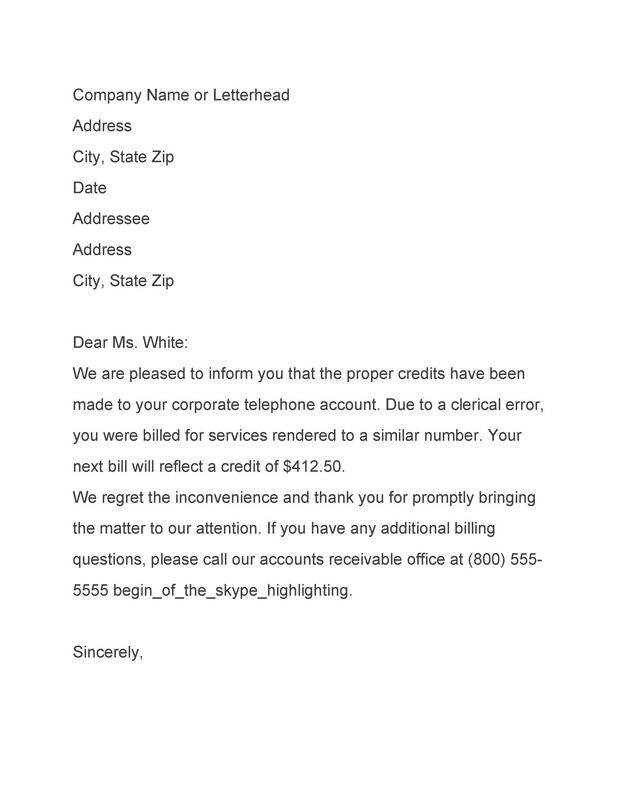 Keep in mind that you can consider an adjustment letter as a legal document and should comply with formality. 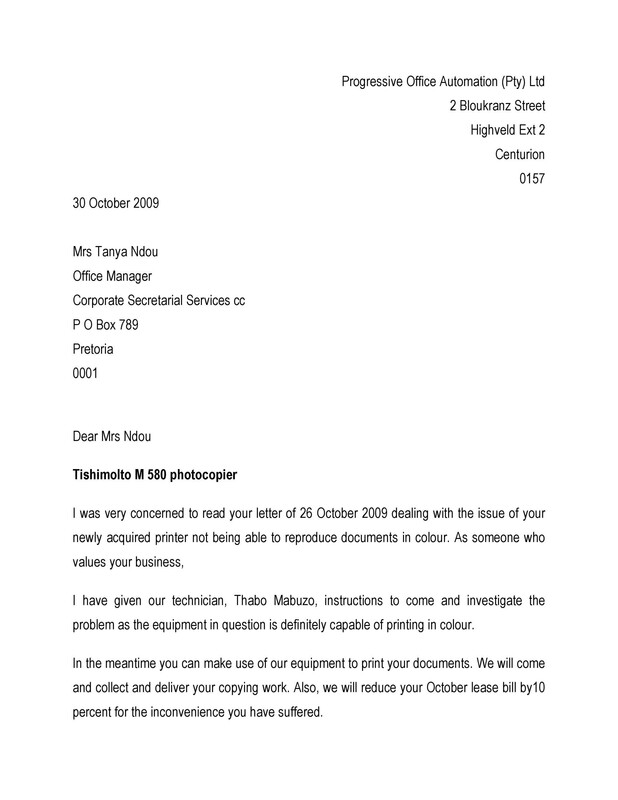 Furthermore, using such stationery will signify that the customer deals with a responsible authority which asserts his belief in his company. 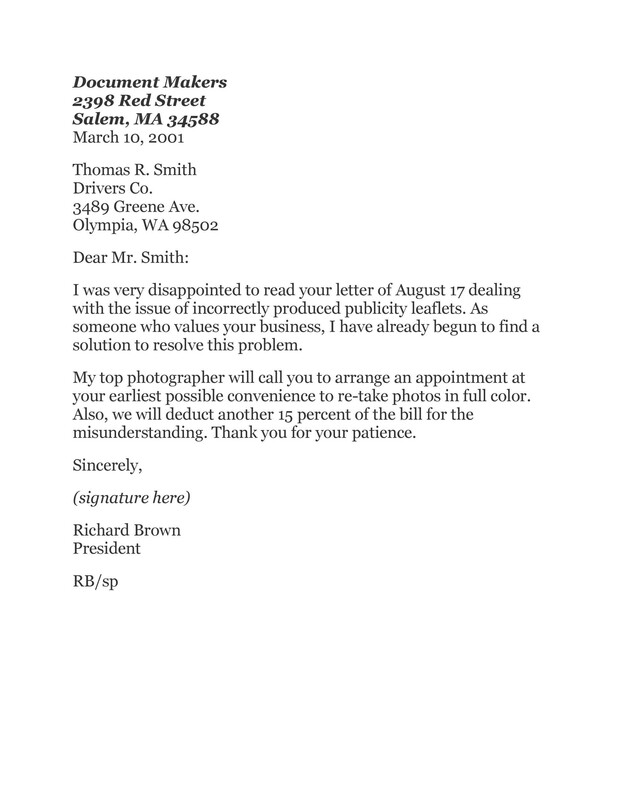 Using a letterhead could leave an impact on the client as it remains embedded in his memory, especially if the result goes in his favor. 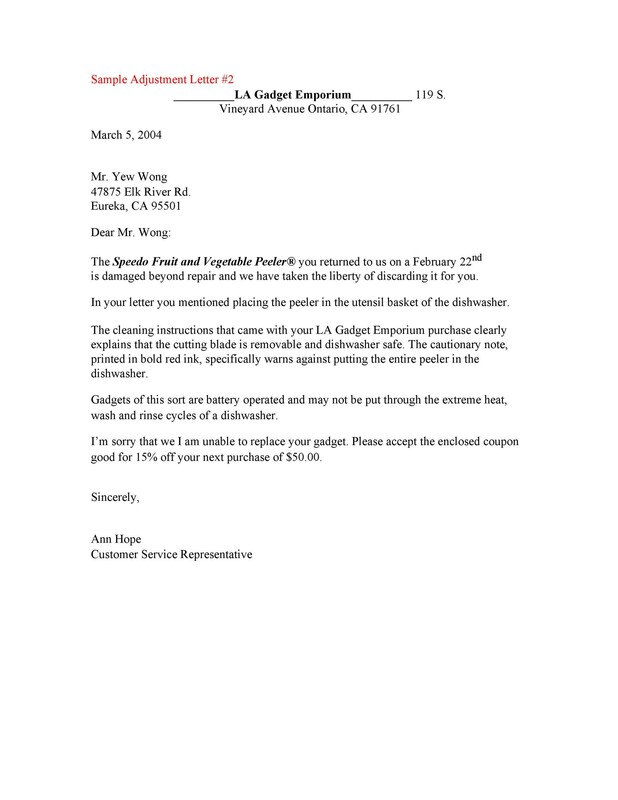 From here, the letterhead becomes a symbol of fairness and gets a satisfied customer who can spread the company’s good image around at no extra charge.